one of the Twenty-One Taras, also white in colour; peaceful and smiling, she holds a lotus upon which is a mirror marked which the syllable Hrī. 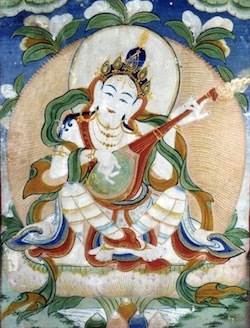 In the Tantric tradition Sarasvati is classified as a wisdom-generating deity. ↑ according to the tradition of of Shakyashri Bhadra and Sakya Pandita Kunga Gyeltsen. This page was last edited on 18 May 2018, at 20:24.